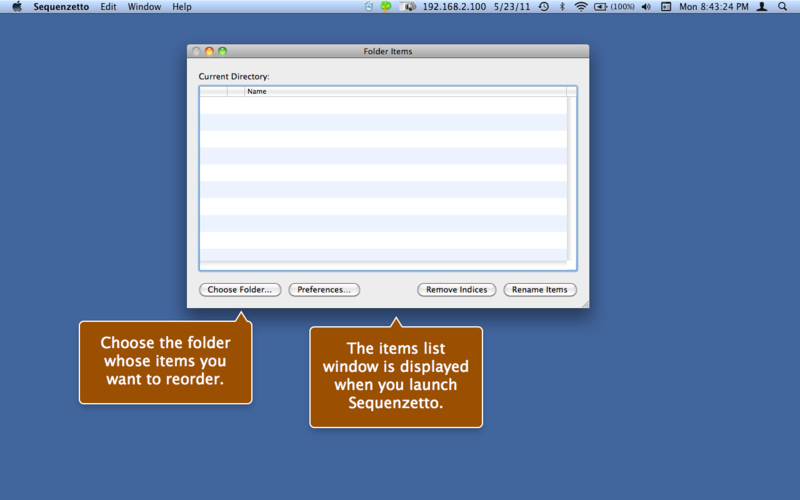 Sequenzetto is a utility for reordering files in a given folder by prefixing their filenames with appropriately formatted indices. To use the utility first find the folder by clicking the button labelled "Choose Folder..." to navigate and select the folder. The names of all files in this folder will appear in the "Folder Items" list. Drag the folder items into their desired order and then click the "Rename Items" button to prefix the names of each file by a "zero padded" index so that it is alphabetically ordered to match the order in the list.